If watercolour techniques inspire you, this may be a workshop that will take you on a similar, yet different journey. 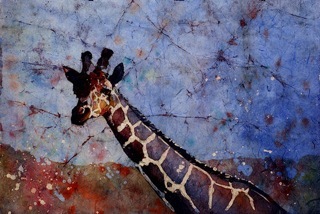 Just bring your creativity, a favorite photo, and your knowledge - whether limited or extensive - of watercolour painting. 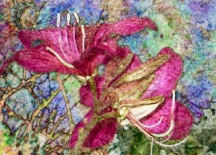 This two day workshop, for all levels, touches on colour theory, and techniques to paint beautiful still life, landscapes, and floral images - with fabric dyes. Students will be lead in a step-by-step experience. Batik is usually associated with fabric designs from Indonesia. This workshop introduces how to apply the traditional Batiking technique to creative painting of landscape, still life and portrait painting. Students will learn the step by step process of applying wax and dyes with their brush, resulting in a finished piece of their own creations. Drawing or painting ability is not necessary with this workshop, so all those interested are welcome. Note: all material costs are included in fee. Please bring a lunch with you. There is coffee, tea, and snacks available and a microwave and refrigerator. Every lesson includes the elements and principals of design.